Here at High Speed Technologies we know proper drawbar pull force is essential for maintaining rigid tool capture. And rigid tool capture is essential for precise high-speed machining and good surface finish quality. Inadequate drawbar tension allows slight movement of the tool holder within the interface surface. This can damage the taper and add as much as $1,500 to the spindle repair. The vast majority of drawbars use springs to provide tension and springs are subject to wear and fatigue. At High Speed Technologies, Inc. we always offer a complete drawbar rebuild on every spindle that we receive with a drawbar. And the drawbar tension is always checked and recorded on the performance sheet we send with every shipment. WARNING! Use extreme caution and wear rated safety goggles when working on drawbars. Springs may be preloaded to several thousand pounds and can cause severe injury or death if not handled properly. We recommend that only trained or experienced professionals handle drawbar systems. Drawbar springs come in three general types; Belleville, Wire Wound and Duplex Flat Wound. Some springs can get very pricey. For instance, one wire wound spring purchased from Mazak had a hefty $3000 price tag! Belleville springs look like dished washers with a hole in the middle. They come in a wide variety of sizes. These are the most common type of spring used with drawbars and the easiest to locate. 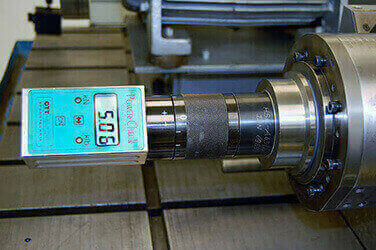 Spindle design engineers use a variety of arrangements to accomplish the spring rate and compression distance needed. Belleville springs can be nested together to make a stiffer spring or they can be opposed to make a longer spring. Most spindles use cut Belleville springs. However, some higher end machines have springs that are ground to precise dimensions. Ground Belleville’s may cost 5 to 10 times more than cut springs. Either way, if the Belleville washers on your drawbar system are not a standard size, we can have them custom made to match. When ordering Belleville springs four dimensions are required, Outside Diameter (OD), Inside Diameter (ID), Thickness and spring height. When selecting Belleville springs for a new design it should be remembered that the OD and ID change slightly as the spring compresses. Left photo: Configuration of Belleville Springs. Middle photo: Specifying replacement Belleville springs. Right photo: This is what failed Belleville springs look like. Helical disc springs were developed in the 1980s by Dr. Werner Röhrs GmbH & Co. They market this spring under the brand name “SCHRAUBENTELLERFEDER”. The Google translator says it means “Screw Counter Spring”. These springs have become common in drawbar applications. They were developed to provide high spring force in a relatively compact configuration. At HST we have inventory of several common sizes and Röhrs will supply certain other sizes. However, often OEMs provide proprietary specification to Röhrs for custom springs. If this is the case Röhrs will not sell the spring to anyone but the OEM. In that circumstance HST may ask you to purchase the spring and ship it to us for installation. Left photo: A “Schraubentellerfeder” spring. Note the double helix flat wire and ground end. Right photo: A cutaway of a“Schraubentellerfeder” Spring. These springs can also be rather pricey costing upwards of $2,000 for a complete set. None the less, it is always our recommendation to replace the springs with every rebuild. All springs have a design life and will fail due to fatigue. Fatigue failure starts as a series of microscopic cracks. Once they start to appear the spring is approaching catastrophic failure. This OTT drawbar assembly out of a Franz Kessler Spindle looks good. But close inspection shows the springs riddled with fatigue cracks and close to a complete failure. Wire wound springs are not particularly common with drawbar applications. They consist of a single “wire” wrapped in a helix. The wire may be rectangular in shape and not round. These can be rather stout affairs. The better springs will have shot peened surfaces to inhibit fatigue crack propagation. Wire wound springs can be extremely difficult to locate and may need to be purchased through the OEM. There are many shops that will custom make a spring to your specifications. If your spindle has a wire wound spring that can only be obtained through the OEM, High Speed Technologies, Inc. may ask you to purchase the part directly and send it to us for installation. In the long run, you will save our small mark-up on purchased parts. The spring pictured below is out of an HSD routing spindle. Although the spring looks very robust, wire wound springs do not generate the same forces as the double wound and Belleville style. None the less, they can be found in several different types of spindles such as the larger Mazak Integrex spindles. So, no matter what type of spring your spindle uses to maintain drawbar tension, sooner or later it will become weak or fail. Check the cycle counter on your machine. If you’re approaching one million tool changes we recommend rebuilding your drawbar assembly with new springs. If you wait until the spindle begins dropping tools it may cause damage that will be very expensive to repair. Call High Speed Technologies today for drawbar repairs or questions 1-603-483-0333, or use the form on this page to get a quote.